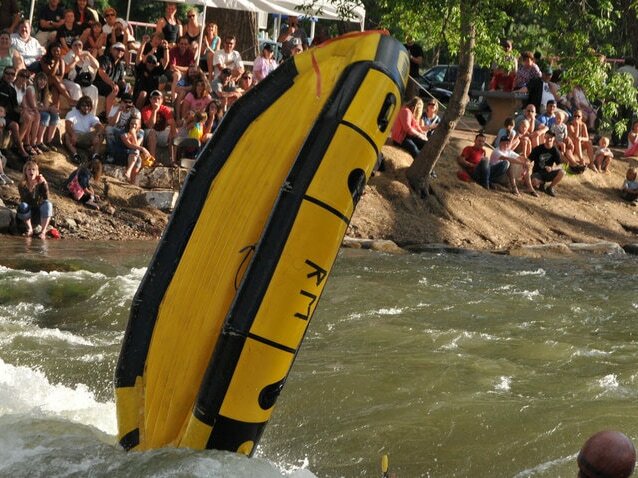 RiverRestoration performed the comprehensive design of the Whitewater Kayak and Recreation Park in Cañon City. The design includes construction documents for two whitewater features and multiple bank terraces with sandstone steps. The project also includes 200 feet of stream bank stabilization with concentrated access points, native revegetation and a wading pool. RiverRestoration provided the survey, recreation design and FEMA conditional map revision analysis for a 2 mile river walk trail, with five pedestrian bridges, connecting downtown Centennial Park and the new whitewater park with Tunnel Drive and the Royal Gorge. Our success in past Recreational In-Channel Diversions (RICD) water right applications has lead to the direct support and funding by the Colorado Water Conservation Board (CWCB) in development of river recreation enhancement design at this location. Completed in 2010, the project was designed to sustain flows of 22,500 cfs (637 cms) through a highly urbanized area. The general community draw is a major success of the project. The project is not just for whitewater enthusiasts; the community now has a beach to enjoy and a stewardship ethic for the river is regenerated in Cañon City.